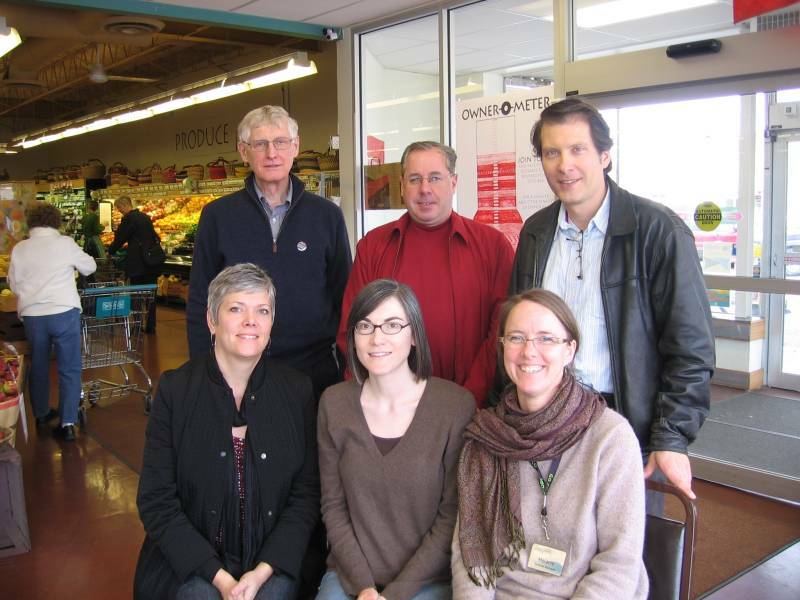 NDDC Board members visited Just Food Co-op last week. Pictured (left to right) here are (front) Jessica Paxton (NDDC), Joey Robison (Just Food), Melanie Reid (Just Food), (back) Keith Covey (NDDC), Joe Grundhoefer (NDDC) and Rob Schanilec (NDDC). Just Food is quite pleased to be in Northfield. Over the past five years their sales have grown from $2 million to $4 million and they now have over 1,800 households as members. They employ 46 people, and about half are full-time. They consider the community to be “the best of both worlds”. While Northfield has a great small town feel and is a genuine community, the presence of the colleges helps to support some more “urban” or “extra” amenities. They think that our location within the region bounded by Faribault, Cannon Falls, and Rochester broadens their geographic market. Melanie and Joey said that having a strong downtown supports their business and they appreciate the “Shop Local” message that the NDDC spreads. They also notice great turn-outs for downtown events and see a resulting sales boost for their store. As for ways to strengthen the downtown economy, they identified what they see to be “holes” in the retail mix. These include a “mercantile” (citing the old Jacobsen’s), a bagel shop, an office supply store, and a community code kitchen (as well as a root cellar). When asked what we could do to improve the quality of life for their workers, they suggested a movie theater. Hmmm, where have I heard that suggestion before?